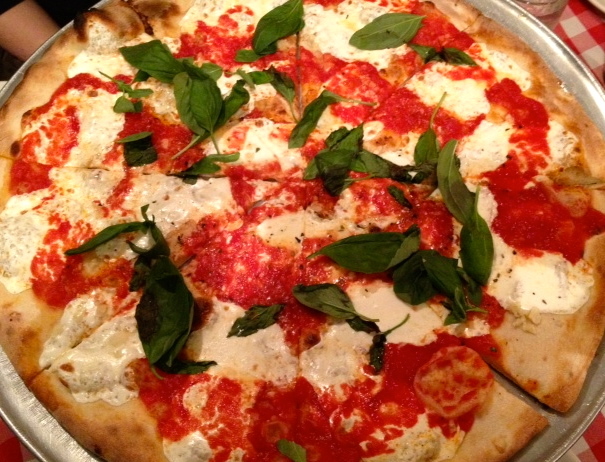 Wanna try the “best pizza in NY” (according to Jon Stewart, and ok, Zagat’s) but not have to wait an eternity for a table? I went to Grimaldi’s recently, the famous pizza joint underneath the Brooklyn bridge, and we got in – on a Friday night at 9, no less – without having to wait more than a few minutes. How? We were a party of three rather than two, so we waltzed in past a huge cue of pissed off-looking couples almost instantly. Moments later, a smoky, crisp, kind of perfect pizza adorned our table, and it might’ve tasted even better knowing how quickly we got in! So next time you have date night, grab an extra friend or a guy crossing the bridge if you have to, and go to Dumbo with confidence. Even on the weekend! Wait a pizza loving minute… you went to BROOKLYN?